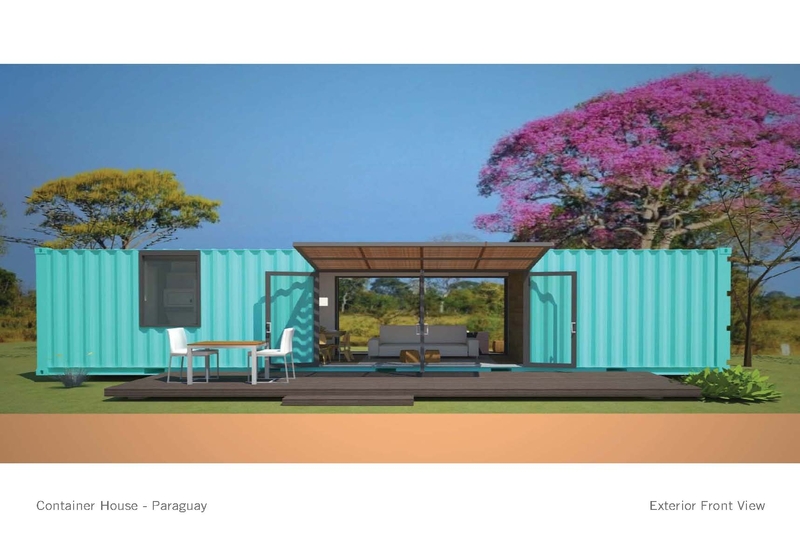 After their initial discussions with housing officials in the Paraguayan government on how to provide one hundred thousand, high impact, inexpensive housing for rural Paraguay, a local Chicago developer retained our firm to study how shipping containers might be utilized to fit the bill. 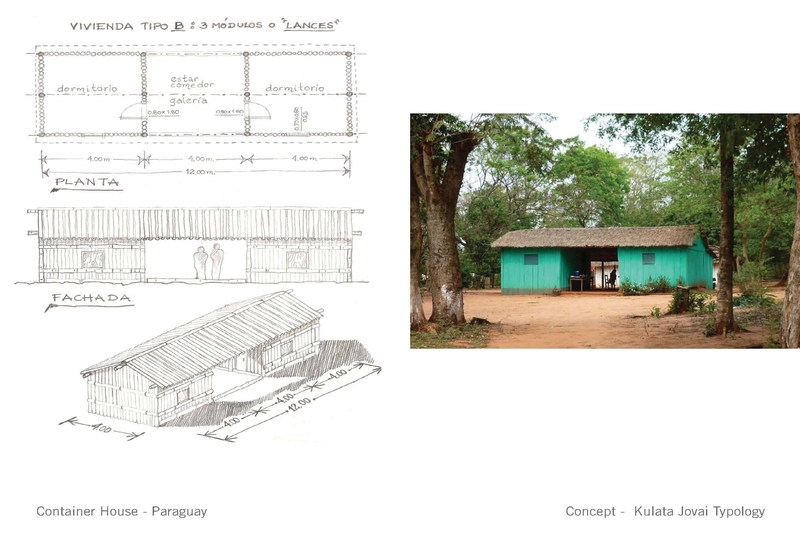 Research of Paraguayan architecture uncovered a house typology specific to the region known as Kulata Jovai. Roughly translated as “rooms facing” or “facing rooms”, Kulata Jovai consist of two rooms separated by an open gallery space or breeze way and that face each other. It’s parti and massing are similar to the American architype, the Texas Dogtrot, in which a single, unifying roof connects two separate massings and forms a central covered breeze way. We proposed both a single container and a two container design. Both are organized in the Kulata Jovai tradition and feature clearly defined central rooms that can be opened to the outdoors via two sets of opposing doors to form breeze ways. 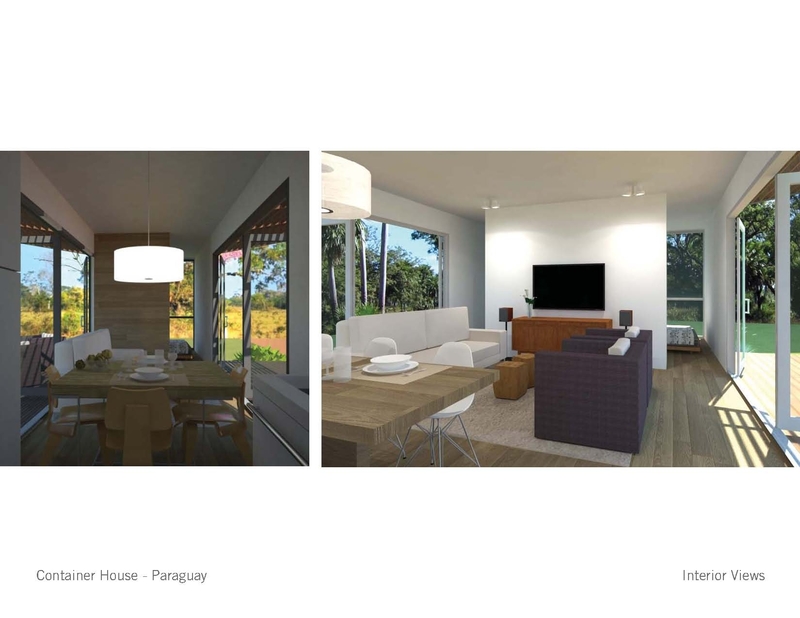 The breezeways in these Kulata Jovai houses can be closed or opened to provide more or less shelter from the elements for the central living area. Twelve feet by seven feet openings are cut from the monolithic skin of the containers to form the biggest massing move. Then, a series of punched openings form windows whose specific size and location are based on the function of the interior room it serves. The houses are painted vibrant colors pulled from the rich South American vernacular. This exuberant celebration of color simultaneously complements the modern massing and ties it directly to easily recognizable architectural traditions. This colorful effect creates a certain pop and contrast as it nestles into its naturalistic rural setting. It is our hope that not only will these small shelters be affordable, functional, and comfortable, but that the owners will be very proud.